This work is conceptualized as an “organic tower,” that responds dynamically to its magnetic environment. 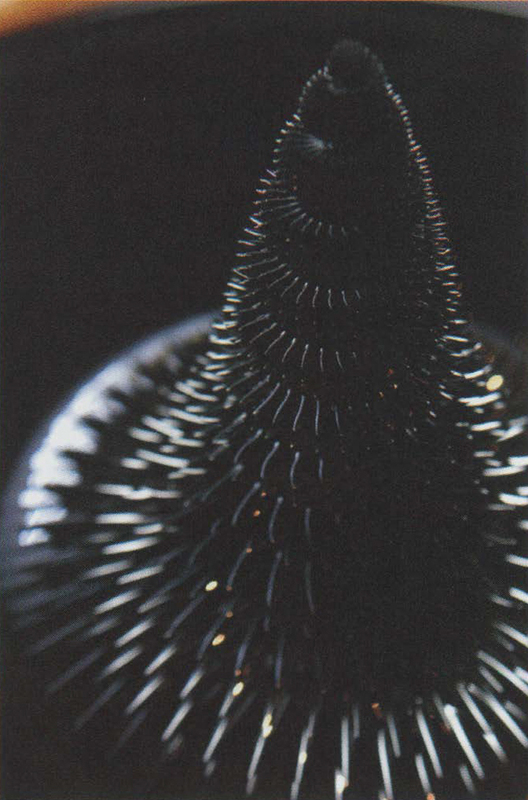 When there is no magnetic field, the shape of the tower appears as a simple spiral, like a drill bit. But when the magnetic field around the tower is strengthened, spikes of magnetic fluid are carried from the bottom plate, and move up, circling around the edge of the iron spiral shape. At the same time, the tower’s surface dynamically morphs into a variety of textures ranging from spiky or hairy to mere goose-bumps. The magnetic fluid, which has a smooth black surface that seems to draw you in, reaches the top of the tower, spreading like a fractal, defying gravity. People can interact with this work by making sounds; they can change the tower’s texture by creating magnetic fields by voice, en­gaging them directly with the artwork. By fusing physical materials, phenomena and digital technology, I attempted to create an exciting and inspiring art for people to enjoy. The body of the MorphoTower was made with a new technique called magnetic-fluid sculpture, which enables the artist to create dynamic sculptures with fluid materials. This technique extends and sculpts the iron core of an electro-magnet. The magnetic fluid cov­ers the sculpted surface of a three-dimensional iron shape that was made with an electronic NC lathe. The movement of the spikes in the fluid is controlled dynamically on the surface by adjusting the power of the electro-magnet. The shape of the iron body is helical so the fluid can move to the top of the heli­cal tower when the magnetic field is strong enough. A microphone captures real-time environmental sound, and a computer analyzes the level and modifies the power of the electro­magnet accordingly. There are two phases to the magnetic-power control process: one controls the position of the fluid, and the other vibrates the spikes according to the sound input. As a result, the fluid covers the sculpture’s surface, and its spikes vibrate like a creature responding to sound.